Barnacle plots at Cayucos historically contained mostly Chthamalus dalli/fissus, with very few Balanus glandula recorded (note that species were not distinguished until 2001). However, Balanus has increased slightly in recent years, especially in plot 5. In general, the cover of barnacles varied inversely with rock cover, with little else occurring in these plots. Littorines were common in the barnacle plots and limpets were also present in moderate numbers. The turban snail, Tegula funebralis, occurred consistently in the plots in low numbers. Mussel plots at Cayucos consisted mainly of their targeted species, Mytilus californianus. When cover of Mytilus declined, rock cover increased, indicating that bare space was generally not colonized by other species. Mussel cover declined somewhat between 1999-2001, and then increased to over 90% cover in 2005-2006, followed again by a gradual decline between 2007-2014. Limpets were abundant in the mussel plots and exhibited strong seasonal variation, with much higher numbers in fall than in spring. 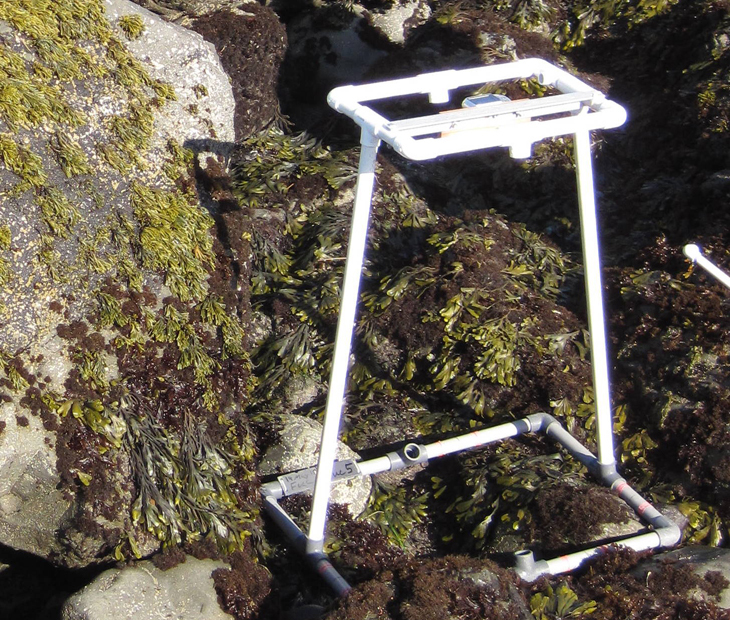 Decline of the upper-shore rockweed, Hesperophycus, was striking at Cayucos during the first few years it was monitored, where cover dropped from over 90% to less than 20%. Hesperophycus cover then stabilized at around 20-30% for nearly 13 years, but then increased to near original levels. However, prior to fall 2014 Hesperophycus declined again throughout the site. Limpets, littorines, and the turban snail, Tegula funebralis, were all common within Hesperophycus plots. Silvetia cover was quite high during the first 5 years at Cayucos, but experienced a substantial decline in 2001, followed by more gradual decline until 2006, when cover appeared to stabilize. Beginning in 2010, cover began to increase, and is currently around 80%. Endocladia and Hesperophycus have increased in these plots during times when Silvetia cover was low, filling in some of the space vacated by Silvetia. In addition, Fucus has increased slightly in these plots over recent years. Silvetia cover was highly seasonal, with lower values in spring vs. fall samples. This pattern is present at many sites, and may be due to a combination of factors including seasonal growth cycles, physical removal by winter storms and desiccation from extreme low tides that occurred in the middle of the day in the spring (timing of low tide is cyclical, so low tides are not always mid-day in spring in this region). Tegula funebralis and limpets were abundant in Silvetia plots, and the chiton, Lepidochitona hartwegii, was consistently present. This chiton is frequently associated with Silvetia, which it uses for protection from desiccation. Endocladia cover was relatively stable over time. A significant drop in 1998 was followed by a recovery to near-original levels. Beginning in 2009, Hesperophycus cover began to increase in Endocladia plots, resulting in a decrease in cover of bare rock. While Endocladia appeared to have decreased between 2011-2013, it was still present (but not captured by the point contact data) under Hesperophycus. However, as mentioned above, prior to Fall 2014 a dramatic decrease in both Hesperophycus and Endocladia occurred throughout these plots. This may have been a consequence of scouring or some other stress, since the plots are now comprised of a fair amount of bare rock. Limpets and littorines were common in the Endocladia plots, which had a large amount of bare space, where diatoms typically grow and provide food for these grazers. Surfgrass cover at Cayucos was consistently high over time, with only slight dips during the 1997/98 El Niño event, and again in 2001 and 2013. The lack of a seasonal pattern in surfgrass cover at Cayucos is likely due to the unique location of the transects at this site. 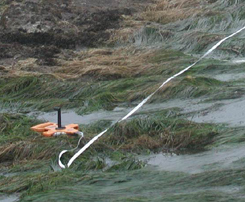 Unlike other sites, where surfgrass transects were established in areas that drain during low tide, transects at Cayucos are located in large pools, which reduces the amount of stress experienced by the plants due to air exposure, and perhaps also abrasion. 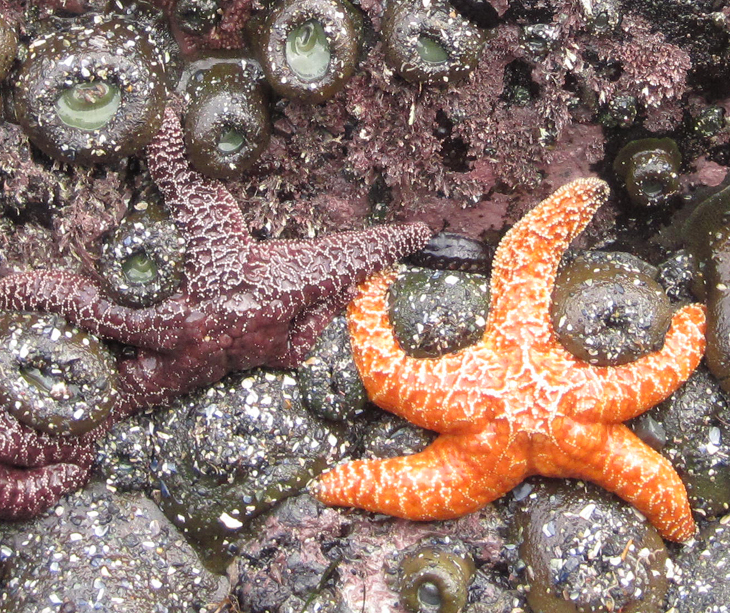 Pisaster numbers have been variable, but were generally increasing between 2000-2007 at Cayucos. A gradual decline in numbers began in 2009, and sea star deaths due to wasting syndrome in 2014 furthered this decline. Very few small stars (< 50 mm radius) have been counted over time at this site, suggesting that recovery could be slow.